Here is your Bible Devotional! Welcome to Day Fifty! A little Bible Devotional tip–Say the Lord’s Prayer during your devotional. It will add an extra worshipful dimension to your quiet time! We as Christ followers have been given a great gift. Our bodies are mere tents. Our true longing is to be present with the Lord where we will stand before Him. As Christ followers who love God, we want Him to be well-pleased, so while on this earth we have an important job. We are ambassadors for the ministry of reconciliation. We are a new creation and as new creations we don’t regard people as mere flesh. There is a battle going on and we are the warriors and the healers to bring the message of reconciliation to all because Christ died for all. We are “compelled by the love of Christ.” Because He loved us. Love shares. He made Him who knew no sin to be sin for us so that we might become the righteousness of God. This is the life of a Blooming Original. One who is a Blooming Original is a new creation, an ambassador for Christ, a lover of Christ, in process of becoming like Christ. Walk in the fact that you are a new creation and an ambassador for creation. Be motivated by your love for Christ because He loved you so much He died for you. Dear Lord, help me to walk in newness of life. Inspire me by your love to be a pleasing ambassador for your name’s sake. Help me to become who you want me to be, help me to become a Blooming Original. Amen. Thank you for following this devotional series! I pray that you have found it beneficial and a blessing! As you know, one of the reasons I’m starting this Bible Devotional is to ask for others to intentionally pray for our business, AngelArts. It’s been a wild ride these last few months and we as a team and company have much ahead of us! Please pray for strength as we strive to become who God wants us to be. 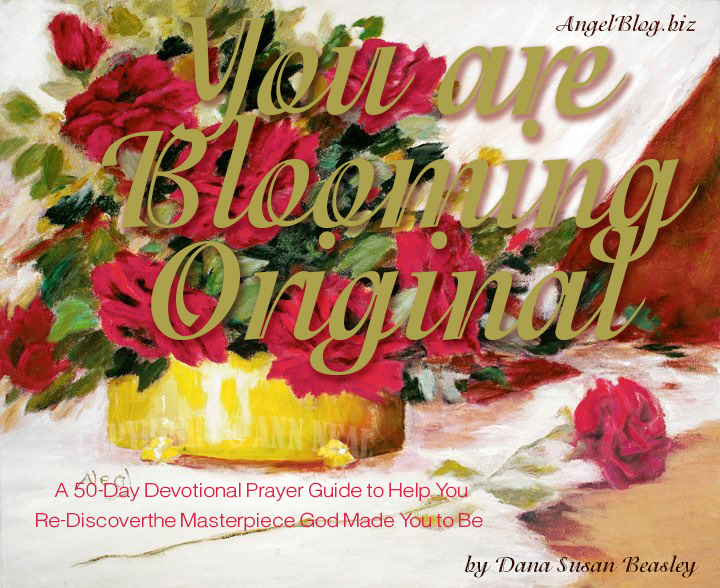 And please pray for the ultimate dream that God put on our hearts–to start an inspirational healing and arts center called Blooming Originals. All our work is a stepping stone to that dream. If you join the Prayer Team, we have created a private Discord channel where we can pray together! Discord is a great tool for connecting and much more secure than FB Messenger. Has this blog series touched you in some way? Leave a comment and share what God is doing in your life and then share this blog to someone who needs this special touch by God!